Bring home Poe Dameron's X-Wing from the movie Star Wars: The Last Jedi! The Star Wars: The Last Jedi Poe Dameron's Boosted X-Wing 1:72 Scale Model Kit is a must have for Star Wars fans. 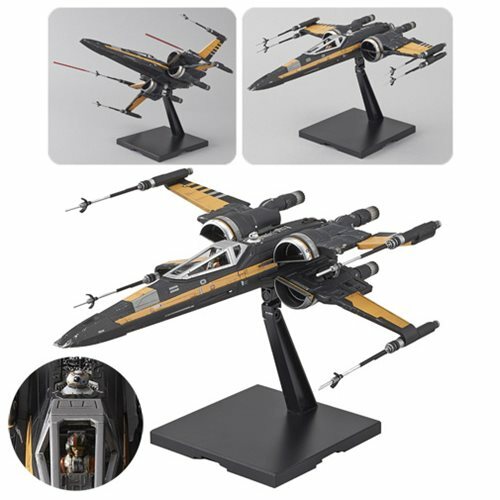 Utilizing Bandai's trademark color injection molding techniques, this 1:72 X-Wing features opening and closing S-foils, laser effect parts that can attach to the wings, a cockpit with 2x different canopy options, and 2x display stands. The kit requires a nipper or sprue cutter to remove parts from runners, but does not require glue to assemble. Set includes 2x types of dedicated display base stands (1x aqua clear and 1x black), 1x pilot, 1x BB-8, 1x RO-H2, 2x laser effect part, 1x landing gears, 2x types of canopies (1x frame and 1x clear version). Water-transfer decal x 1 Marking sticker x 1. The model has a 6-inches wingspan and 6 7/10-inch long body. Ages 15 and up.